The south slope is just as steep and unsuitable for the construction of an entrance to the top of the Sacred Rock as are the north and east sides. It is, however, the brightest side, the side with the most sunlight, and the one chosen by the ancient Athenians for building their most important sanctuaries, theaters, arcades and other subsidiary buildings for various functions. 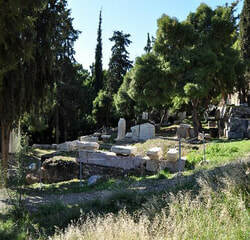 The south side is therefore considered today to be one of the most important of all the archaeological areas in Athens. The Peripatos ran along the entire south slope, going right through the cavea of the Theater of Dionysos. Leading to the south side also was Tripodon Street, which began in the area of the Prytaneion, on the north side of the Acropolis near the Agora. Around 330 B.C., when Lykourgos was archon, the Sanctuary and the Theater of Dionyssos in the eastern part of the South Slope were completely configured. In that period the later Temple of Dionysus, with the altar in the east, and the so-called Doric stoa in the northern part of the sanctuary are, probably dated. At the same time, the theater acquired its monumental dimensions and form. It was constructed entirely by stone and was extended up the foothill of the Acropolis rock, including Peripatos, the road that ran around the hill. Around 320 B.C. the Choragic Monument of Thrasyllos, north of the Theater of Dionysos and the Choragic Monument of Nicias west of the cavea of the theater, were added. The Choragic Monument of Nicias. The formation of a circular area slightly north of the temple, used for the celebration of the cult dance in honor of the god, is dated in the same period (second half of the 6th c. BC.). This area gradually took the form of the Theater of Dionysos, where the works of the great dramatists of antiquity were performed. In the 5th c. BC, in the western part of Asclepieion, a stoa erected with four rooms, which is considered the earliest building of the sanctuary, as well as the Odeon of Pericles, to the east of the Theater of Dionysos. In the 4th century. B.C., in the eastern part of the Asclepieion the temple of Asclepios together with the altar and the Doric stoa at the north, were constructed. ​In the 2nd century B.C., in the area west of the Theater of Dionysos, the Stoa of Eumenes was erected, donated to the city by the king of Pergamon, Eumenes II. In the 2nd century A.D., on the western edge of the area, Herodes Atticus built the magnificent Odeon. ​Another early-Christian church was built in the middle of the same century, in the eastern side street of the Theater of Dionyssos. In the 11th or 12th century A.D., slightly further east of that church which had been already destroyed, the church of St. George the Alexandrian was built, which was destroyed during the Greek Revolution.